더 많은 아줌마와 할머니, 아저씨와 할아버지들을 sns의 세계로 모실수 있는 방법은 뭐가 있을까? 단순히 ‘할머니가 하는 인스타’라서 신기함으로 끝날 것이 아니라, 그동안 대부분의 sns가 youth와 젊은층에 포커스를 맞추고 있었다면, 이제는 그 세대들을 벗어난 다른 세대들까지도 흥미를 느낄 수 있는 그런 sns의 필요성이 더욱더 간절해진다. 즐거운 연구 또 하고 싶다. Instagram is now a big thing which is known as a visual communication platform. Before I use the Instagram, Flickr was one of the biggest visual communication platform through photo sharing on each user’s Flickr page. In my case, I uploaded various photos that were mostly taken by professional cameras (includes film and digital cameras). Compared with these days, Flickr users mostly uploaded photos that have more specified topics or stories than mundane and ordinary records by Instagram users. And Instagram is a sort of a common ‘thing’ or “ambient play” (Hjorth 2015) which people take photos, upload them and share them with others in their everyday life through using their smartphones (or computers). They rather record everyday objects, every moment and everything they want to take,upload and share. Thus, Instagram is not just a photo sharing application. It becomes a visual communication platform that allows its users to communicate with each other visually through sharing photos and videos. Furthermore, using hashtag (#) enables them to get to know other users whom never met before. Sharing the same interest through hashtag allows these strangers to have chance to know each other slightly. There are innumerable kinds of hashtags are sharing among Instagram users every second. I can’t enumerate every single hashtag in this post but I would like to talk about hashtag of ajummas in Korea. Yes, there are hashtags about ajummas as well. These hashtags are mostly written in Korean (#Ajummastagram, #Ajumma, #Jummagram, etc.). I do check the hashtags about ajummas almost everyday because I’m curious how many Ajummas are now using Instagram. Well, there are many Ajumma hashtags but these ajummas are very young. I mean Ajummas in Instagram are younger than ajummas in my research. I think the age range of these ajummas in Instagram are from mid 20s to mid 40s. Compared with ajummas in my research, they are from mid 40s to late 60s (yes, older than ajummas in Instagram). The ajummas in Instagram are more likely a group of ‘mom’ I can tell. They share photos of babygoods, restaurants, shopping tips (cosmetics, shoes, sale information), selfies, etc. Surprisingly, they put themselves as ‘ajummas’ in hashtags. I can’t say ‘everyone’ but most of them (married women who are between 20s to 40s) don’t want to be called as ajummas in general through my research and various media. But why do they call themselves as ajummas??? 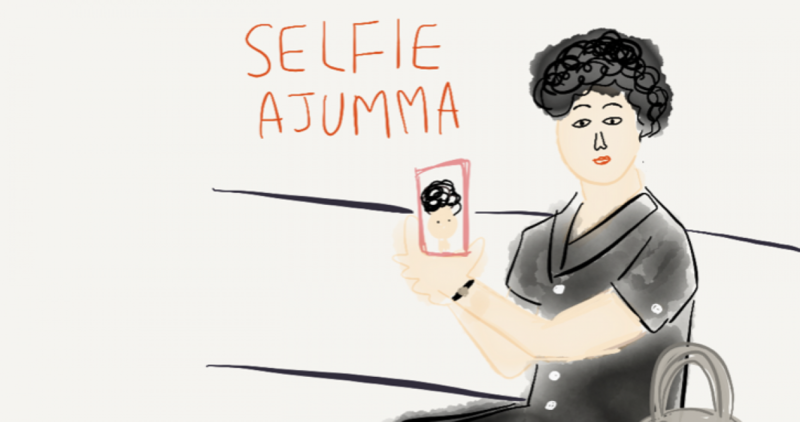 I don’t know why they identify themselves as ajummas in Instagram (mobile space) but I keep thinking about this. And another interest things is that Instagram is not as popular as Kakao Talk or Kakao Story for ajummas who are between mid 50s to late 60s. It is hardly found the ajumma users of those ages in Instagram yet. Why? I should keep thinking about this.